Hinge bearing kit for Dometic series RM series 4 fridges. Left and right included. 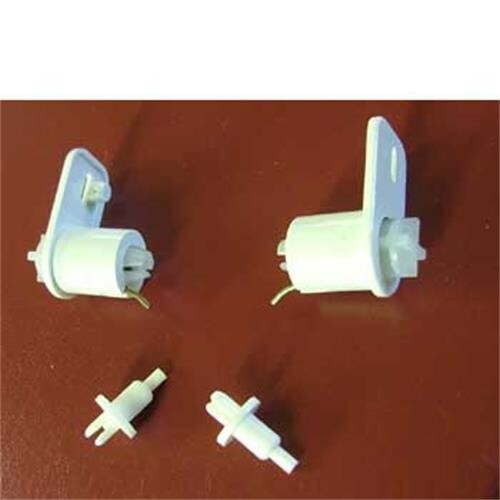 The Dometic Hinge bearing kit for freezer door (2412865004) will fit to the following models : Dometic RM4271lm, Dometic RM4290l, Dometic RM4291lm, Dometic RM4360l, Dometic RM4361, Dometic RM4365lm, Dometic RM4400 L, Dometic RM4401, Dometic RM4365lm, Dometic RM4361, Dometic RM4400 L, Dometic RM4360l, Dometic RM4292, Dometic RM4291lm, Dometic RM4271lm, Dometic RM4290l, Dometic RM4365lm, Dometic RM4400 L, Dometic RM4361, Dometic RM4360l, Dometic RM4292, Dometic RM4291lm, Dometic RM4271lm, Dometic RM4290l, Dometic RM4270, Dometic RM4405. I have. domestic 4270 fridge. The freezer compartment door just flops open. Can you supply the 2 lugs and coiled spring things to introduce tension to keep it closed? These are our ref. 218931. The freezer compartment door on the Electrolux Fridge will not close properly it just flops open. I think it needs replacement hinges? I am not sure of the model no. as the Elddis manual says RM4233 but the Electrolux manual says RM4270 or RM4271. I suspect that the hinges are the same for all three models. Can you advise please? PS: there is no label on the fridge itself. What model fridge do you have? The spring loaded door hinges may be our part 118931. Nice and easy to fit and good service.thanks. My hindges for the freezer door in my caravan fridge were broken. Being in NZ getting parts for a European caravan might have been difficult as my van is 0 years old. Leisureshopdirect had exactly what I needed and it arrived in less than a week. Superb service with all the necessary instructions. Very easy to fit using the clear instructions provided. Ultra-fast delivery too! Very pleased indeed with this kit. This package comes with everything needed to fit the hinges quick and easy to a caravan fridge freezer compartment. Instructions are easy to read too, just make sure you have time as it can be a bit fiddly working in the small space available, but its worth it at such a great price. Had broken freezer door hinge which would not close. Looked on various websites and found this website which was the cheapest , half the price in fact. Ordered the item and arrived within two days. Repaired freezer door hinge no problems, done within 10mins and didn't have to cut old door catch. Works perfectly now. What a superb supplier of spares. I never imagined it would be possible to actually find the correct replacement freezer hinge bearing kit for the right Dometic model and Product Number . A Best Practice website with excellent service and at last, I no longer need to make do with a broken hinge. Good Product , You can fit the hinges without removing the door stops, Job done in 15 mins. What can I say? Easy to follow instructions,fixed and no messing. Excellent product and great service, arrived in the post next day. Very clear instructions. I cut the door stop pegs off with a stanley knife before refitting. The freezer door now closes as it should. Very competively priced product. Excellent service. Must follow instructions carefully but cut the door stop pegs off before fitting new hinges. thank god for clear instructions ! The kit comes with everything included .to fit the hinges and get spring tension , it is necessary to remove the two peg stops .The best way is to carefully cut them off flush with the side and push the remainder inside.It is a bit of a fiddle but follow insstructs and only fit the innermost hinge screws to the door first and then the outer ones and fully tighten when the door is raised . Job done appartr from the new peg stops ,a gentle tap with a hammer sets the retaining pin flush into the barb.